Recent Additions to A&M-SA Library What is Course Reserves? Access resources for your research: journal articles, e-books, videos, primary sources, and more! Get S.M.A.R.T. @ Your Library is a series of workshops and online tutorials designed to help you with different aspects of your research and writing. 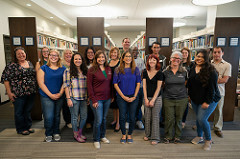 The University Library at Texas A&M University-San Antonio fosters collaboration among faculty, staff, and students to create an atmosphere of academic excellence and provides the university community with tools for lifelong learning. The library is actively engaged in the teaching, research, and outreach activities of A&M-SA. Library staff promote an inclusive culture through our services, resources, and support.